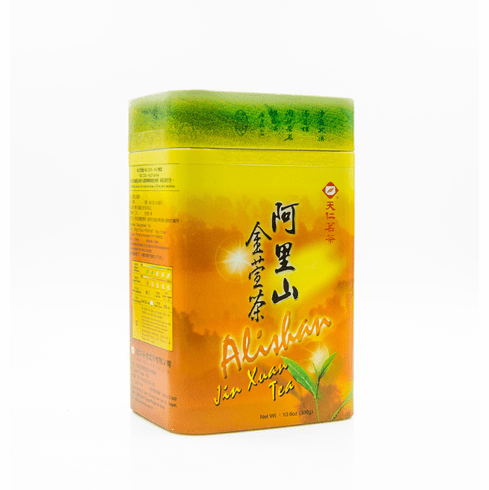 The leaves of Alishan Jin Xuan Oolong Tea are grown in the famous Ah-Li Mountains in Taiwan. At the elevation of 950 to 1000 meters, the mountainsides are covered with fog or clouds which are ideal for growing Oolong. Jin-Xuan is a special variety of Camellia Sinesis (tea plant) developed through research at the Taiwan Tea Agricultural Research center. This special variety is known for producing a Oolong with a special fragrance and a very light creaminess. Alishan Jin Xuan Oolong brings one of the great locations for growing Oolong tea together with one of the special Oolong varieties, Jin Xuan. The water used to steep this tea should be about 185-195�F or 85-90�C. Use about 2 teaspoons (3 grams) of tea leaves for about every 5 ounces (150 milliliters) of water. A steeping time of about 3-5 minutes is recommended with more or less time depending on the desired concentration. As a rough guide, the higher the temperature of the water or the greater the amount of leaves used, the shorter the steeping time should be. The tea leaves should uncurl for full flavor. For the ultimate enjoyment, a traditional Chinese Yixing teapot is recommended for loose oolong tea. The teapot should be half filled with leaves and initially steeped for 45 seconds to 1 minute with the steeping time increased by an additional 15 seconds for each successive steeping. The leaves may be steeped multiple times. Net tea weight is 10.6 oz (300g) and shipping weight is 1.10 lbs.